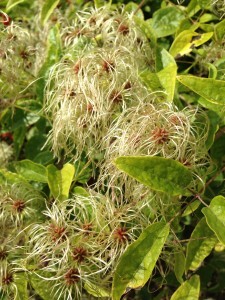 Last week I mentioned that I’d heard news of a sloe disaster. A sloe emergency, if you will. Shrivelling sloes. In September! This is baaaaad news. 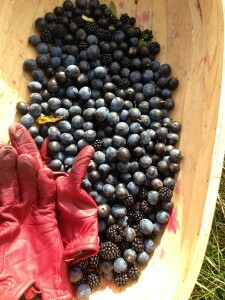 Usually I am late with my sloe picking, and that’s at the end of October. But to have them going over at the start of September? Well, that’s just nature turned on its head. Autumn is weeks early this year. So to the shire for a morning of seasonal hunter gathering. First up, apples and pears. There’s only one place to go, Clives Fruit Farm. I love Clives. This is a farm shop in the old fashioned sense, with huge bins of fruit, chooks running around, and a few old men sporting overalls and boots that have possibly been in use since the 1940s. 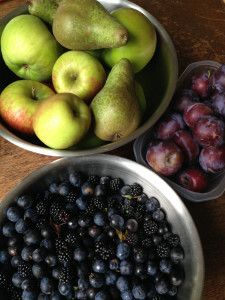 I leave with plums, bramleys, some other apples that I’ve never heard of, cider, bacon, pork, beef…it’s all good. Over the years I have had to learn the art of protecting oneself against the wickedness that is the blackthorn tree. This is one spiky bugger. 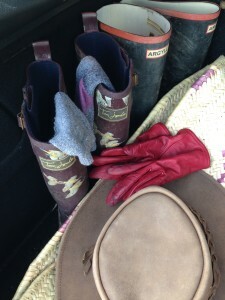 There are three essential bits of kit: wellies, leather hat, leather gloves. 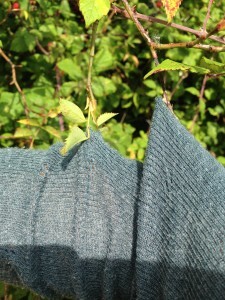 Of these, the most important is the wellies – not for protection against mud, but against brambles that come up to the knees. Long sleeves are a given. You might look like an idiot, but better that than a scored arm. Though actually I love dressing up in my yokel country clothes. The berries are abundant this year and I’ve come home with a trugful of fat, round sloes with a special bonus picking of blackberries. 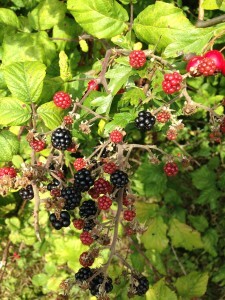 To be in amongst the brambles and grasses, with the sweet scent of autumn in the air…this is the essence of living. Only a fool discloses their special place for foraging so suffice to say that I was near a hill, could hear the sheep having a chat amongst themselves and also the geese who appeared to be losing their minds at the dogs on walkies. 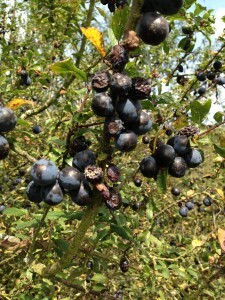 I was right to go out now – some of these sloes are already going over. The effects of an early spring, hot summer, dry early autumn combine, and in a week’s time they will be gone. I’m not a particularly patient picker and usually give up far earlier than perhaps I should. But today was a good picking. Next up: sloe gin. This entry was posted in Worcestershire and tagged apples, blackberries, Clives Fruit Farm, pears, sloes. Bookmark the permalink.